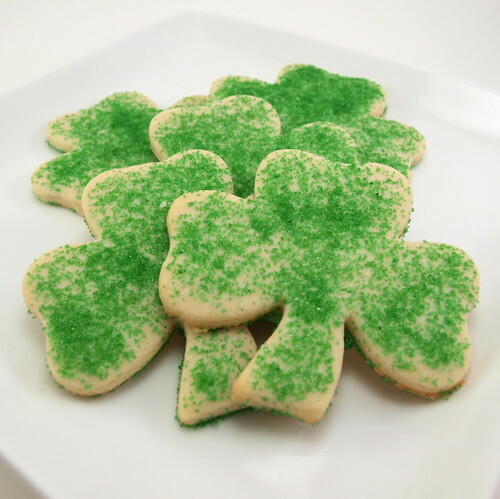 First, HAPPY SAINT PATRICK’S DAY! Second, I need to apologize to you all. 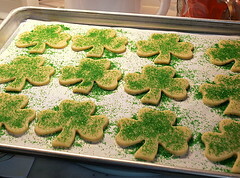 I realized this week, while making 15 dozen of these cookies that I have never shared the recipe with you. I am a bad blog friend, but I plan to make amends today! As with many of my recipes, this is a modification of an old family favorite. The original recipe was clipped from a Land O’ Lakes holiday cookie book many, many years ago, but of course I have my own modifications. First was some salt. The cookies were sweet but a bit bland so I added some kosher salt and salted butter. That perked the flavor right up. Also, since we are talking about perking up flavors, I added a drop of almond extract. The cookies do not taste of almond but the tiny bit of extract really adds a lovely aroma and depth of flavor to the cookies. Last was to substitute lemon juice for milk in the cookies. I like lemon cookies just fine, but when I am eating a sugar cookie I want vanilla bliss. 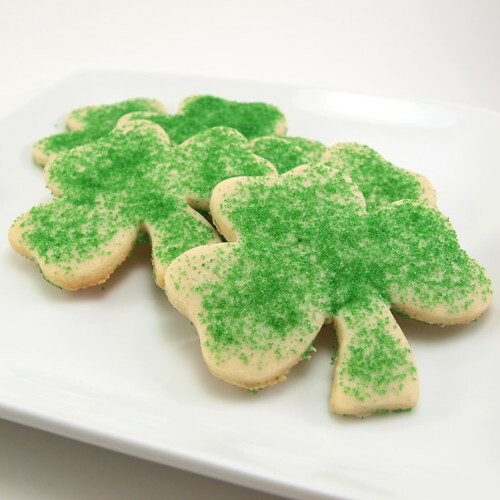 The milk makes the cookies tender without adding any flavors. These are lovely for the holidays, but I like them all year round! 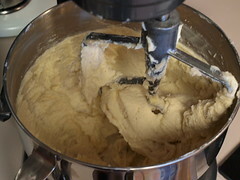 In the bowl of a stand mixer, or in a large bowl, cream together the butter, sugar, vanilla, almond extract, and salt until light and fluffy. Scrape down the side of the bowl then add the egg and milk. Mix on medium speed until pale in color and fluffy, about two minutes. 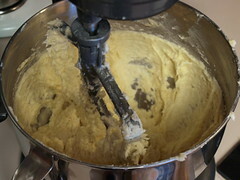 Scrape down the bowl again and add the flour and baking powder. 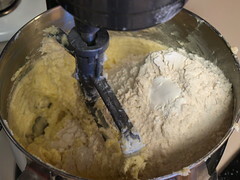 Mix until the flour is well incorporated. Wrap the dough in plastic and chill for at least an hour, or overnight. Heat the oven to 375 F and prepare two pans with parchment paper. Divide the dough in half, leaving the half you are not working with in the refrigerator. Dust your work surface lightly with four and roll out the dough until it is 1/4″ thick. Cut the cookies into the desire shape and place on the prepared pan. You can decorate with colored sugar at this point, if desired. 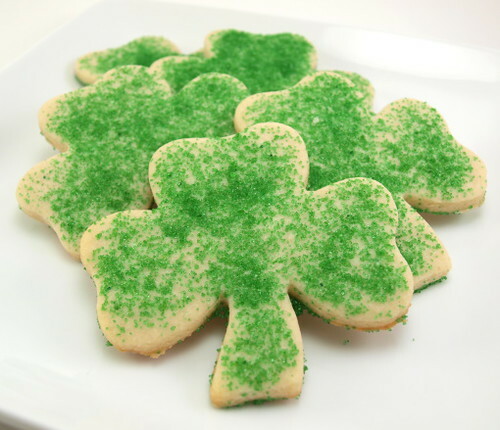 Re-Roll the scraps as many times as needed, just be careful not to use too much flour for dusting. 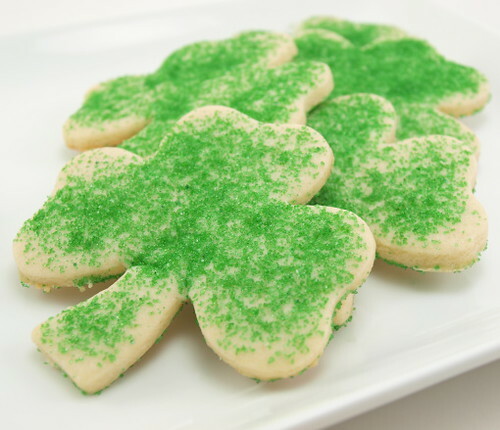 Bake for 9 to 12 minutes, or until the cookies are just slightly golden at the edges and firm in the center. Cool for ten minutes on the pan before transferring to a wire rack to cool completely.